I recently was appointed to the Analytic Community Experts group for crowd sourced consultancy Wikistrat. 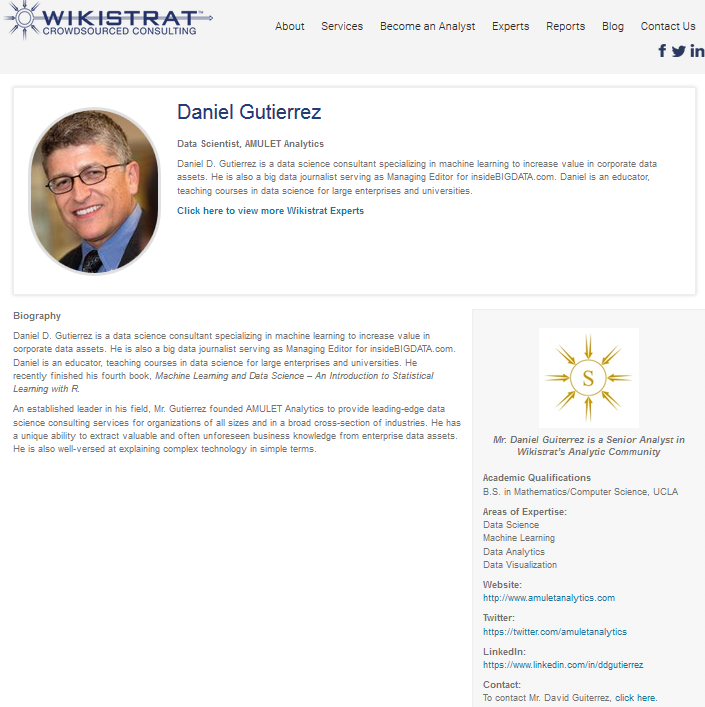 Based in Washington DC, Wikistrat operates a global network of over 2,000 subject-matter experts working collaboratively via an online platform to help decision-makers identify solutions to complex strategic challenges. Here, I will offer my insights in data science, machine learning and big data to assist in building the wisdom that is essential for dealing with an increasingly complex world. 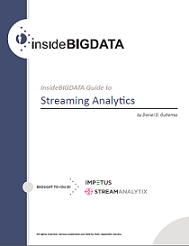 I’m excited to announce the availability of a new technology guide that I was contracted to research, develop and write – “insideBIGDATA Guide to Streaming Analytics” sponsored by Impetus Technologies, Inc. Many enterprises find themselves at a key inflection point in the big data timeline with respect to streaming analytics technology. There is a huge opportunity for direct financial and market growth for enterprises by leveraging this technology. The goal of this guide is to make sense of the vendor and technology landscape. It’s important to choose a platform that will supply a proven and pre-integrated, performance-tuned stack, ease of use, enterprise-class reliability and flexibility to protect the enterprise from rapid technology changes.